First marinate chicken with finely chopped garlic, coriander leaves, green chilly, salt and set aside for at least 15 minutes. Then beat the egg with flour, baking powder , lemon and add to the marinated chicken just before frying. Now about 4 tbsp of water to make the batter of dropping consistency. And then heat oil in a small deep fry pan. When the oil is hot to medium low and add the chicken pieces. Now fry each side for about 4 minutes so that the chicken is cooked inside. When fry till brown on the outside, then remove from oil and place on a paper towel to soak up excess oil. 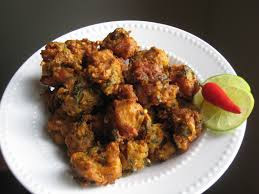 Finally serve this Chicken Pakora any decorated plate or decorated bowl.